Trajectory of a true Ballantine Blast. Another photo re-creation shows the moonshot soaring to the right of the lights, which would not have been cleared in the present photo. 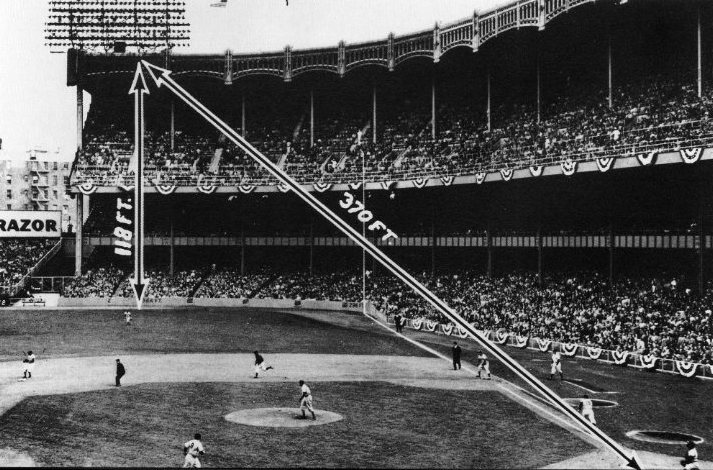 May 22, 1963, Yankee Stadium (the original), Mickey Mantle almost bombs a home run out of the park. Mantle considered this the hardest ball he ever hit. Bill Fischer was the pitcher off whom this satellite was launched. Estimates of a 600-foot blast had the Stadium facade not got in the way are probably “over the top”. But it certainly was a shot heard round the world—or at least the Bronx. This entry was posted in Baseball, Yankees and tagged Bill Fischer, Mel Allen, Mickey Mantle, New York Yankees, Yankee Stadium. Bookmark the permalink.